NASA and Verizon partner to track and communicate with drones using cell towers. 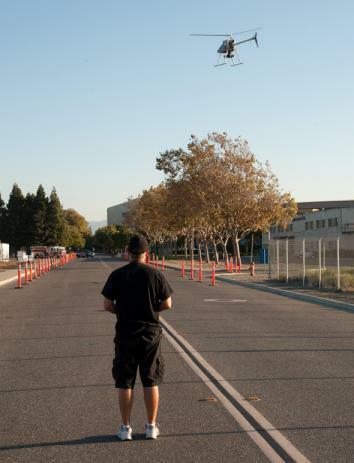 Flying a drone at the Ames Research Center ahead of the 2015 Unmanned Aerial Systems Traffic Management Convention in July. NASA and Verizon are working together on a $500,000 effort to develop a sort of air-traffic control on cell towers for small, low-altitude drones. Documents that the Guardian obtained through the Freedom of Information Act show that the project is developing ways to track and communicate with unmanned aerial vehicles. The partners are working out of the NASA Ames Research Center in Silicon Valley “to jointly explore whether cell towers … could support communications and surveillance of unmanned aerial systems (UAS) at low altitudes.” The first tests of the system are scheduled for this summer, and Verizon is working toward offering things like navigation and data for drones by 2017. The Guardian reports that the final goal for completing the research is 2019. Since the FAA is still debating a proposal for drone regulation, any NASA/Verizon system will have to be adaptable based on the weight, distance, and speed requirements the agency imposes. Google and Amazon are both working on drone research at Ames as well. Google has a $450,000 contract to test its self-driving cars and share data from its drone testing, Project Wing, with NASA. Amazon’s contract is for $1.8 million to work on developing systems for Prime Air. As drone technology goes mainstream, we may see more unlikely allies entering the field together.